Posted By:Unknown | At:6:13 AM Be the first to comment! (Rolling Stone) -- The estate of Marvin Gaye is firing back at Robin Thicke over more than "Blurred Lines," the title track of his latest record. The family initially claimed that Thicke's hit plagiarized the soul icon's 1977 track "Got to Give It Up" – and now, they're insisting that the singer stole from two of Gaye's songs. In August, the writers of "Blurred Lines" – Thicke, Pharrell Williams and Clifford Harris, Jr. – preemptively sued Gaye's estate after complaints (as well as the group Funkadelic), claiming that "Blurred Lines" was "starkly different" from "Got to Give It Up." Now Gaye's family have filed a countersuit against Thicke that claims he not only ripped off "Got to Give It Up" but that he also infringed on the copyright to Gaye's song "After the Dance" for the title track of his 2011 album Love After War. Legal papers also suggest that they're eyeing other songs in Thicke's catalog over the singer's alleged "Marvin Gaye fixation," according to the Hollywood Reporter. 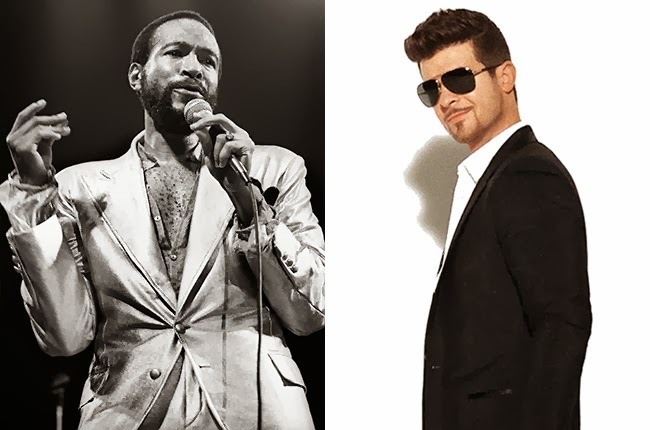 In their suit, the Gayes accuse Thicke of writing a similar chorus, melody and more in his song "Love After War," with regard to Gaye's "After the Dance." They also accuse Thicke of "including the similar bridge and identical lyrics from Marvin Gaye's 'I Want You' in [his] similarly-themed work, 'Make U Love Me.'" They have not yet filed any claims over that song yet. The lawsuit also goes after Gaye's music publisher, EMI April, which now operates under the company that manages Thicke's music, Sony/ATV. According to THR, Gaye's family accuses the music publisher of not protecting the singer's songs, attempting to scare them away from taking legal recourse, giving up neutrality when the conflict of interest arose and trying to draw public support away from the family. The family's goal is for EMI to lose the rights to Gaye's catalog, as well as all profits accumulated from "Blurred Lines." Specifically, the lawsuit singles out the chairman of EMI and its legal representative. It claims they accused the Gayes of "ruining an incredible song," "killing the goose that laid the golden egg" and sullying the opportunity for "Blurred Lines" to win an MTV Video Music Award, as well as stifling its chances for winning a Grammy. The family also accuses EMI of "planting" a story claiming that the family turned down a "six-figure settlement" when no such offer was made, "in order to make them appear unreasonable." The Gaye family's lawsuit claims that Thicke admitted that he stole music from Marvin in pre-release interviews. They cite quotes from a GQ interview in which Thicke claimed one of his favorite songs was "Got to Give It Up" and told Williams, "Damn, we should make something like that, something with that groove." Thicke has since denied any association with the Gaye song. Gaye's family quote critics who have claimed to hear a resemblance between the songs in reviews for Rolling Stone and The New York Times. It also quotes a musicologist who claims Thicke's song has surpassed the "similarities that might result from attempts to evoke an 'era' of music or a shared genre." Thicke has yet to comment on these new developments.